The Elmhurst College Jazz Festival’s roster of festival judges and performers reads like a list of jazz greats, including the Count Basie Orchestra, Dizzy Gillespie and modern musicians such as Bill Evans and Diana Krall. Each year, the festival brings together some of the greatest names in professional jazz and the best college jazz bands for three days of performances and education. Trevecca’s own jazz band, TNaz Jazz, recently took part in the 52nd annual Elmhurst College Jazz Festival, held Feb. 21-24 in Chicago. During the festival, the band performed before a panel of judges that included acclaimed musicians Randy Brecker, Mike Stern, and Bill Evans. Brecker, an influential jazz composer and artist, is best known for his work with the Brecker Brothers Band, while Evans, a Grammy Award®-nominated saxophonist and producer, has worked with the likes of jazz legend Miles Davis. Stern, a guitarist, has also worked with Davis and has received six Grammy Award® nominations during his career. The judges recognized four members of the band with outstanding musicianship awards: Mason Leih (junior, trombone), Jakeim Ivory (freshman, tenor sax), Joshua Flowers (sophomore, piano/trumpet) and Kasey Strange (sophomore, trumpet). Dr. Matthew Murdock, the lead instructor of the band, was proud of his students’ success. The judges complimented the band’s blend, energy and dynamics as well as the talent of the vocalists. During the performance, nine of the 18 band members performed improvised solos, something Murdock was proud of. The band scheduled two performances along the route to Chicago, one at Greenbrier High School in Greenbrier, Tenn., and another at Sweetwater headquarters in Fort Wayne, Ind. Sweetwater, the largest online retailer of musical instruments, is a highly influential music company. Their headquarters includes corporate offices, warehousing facilities, along with recording studios, two performance venues, and a music academy. After performing at the festival on Friday, Feb. 22, the band members had a chance to explore Chicago, something freshman Riley Farley enjoyed. 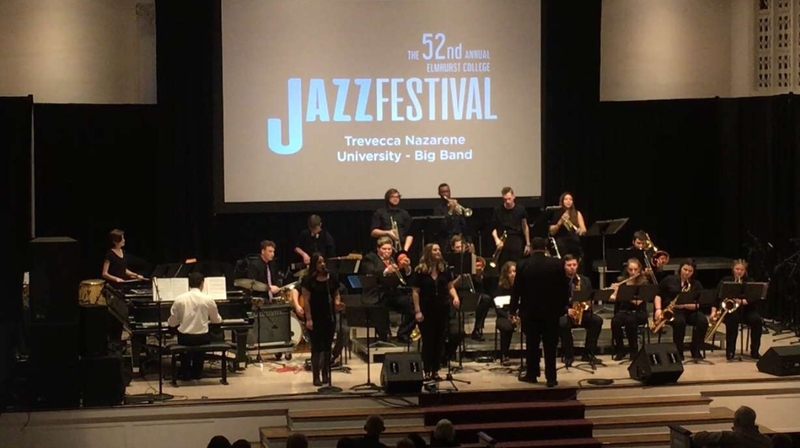 TNaz Jazz will have their final concert of the semester at 7 p.m. on April 25, 2019 at Trevecca’s Zelma Performance Hall, located in the Jackson Center for Worship and Music Arts.